Wie die 16S rDNA sequenziert wurde bitte hier schauen. This entry was posted in Allgemein on 5. April 2019 by hannahadmin. This entry was posted in Allgemein on 27. März 2019 by hannahadmin. This entry was posted in Allgemein on 18. März 2019 by hannahadmin. 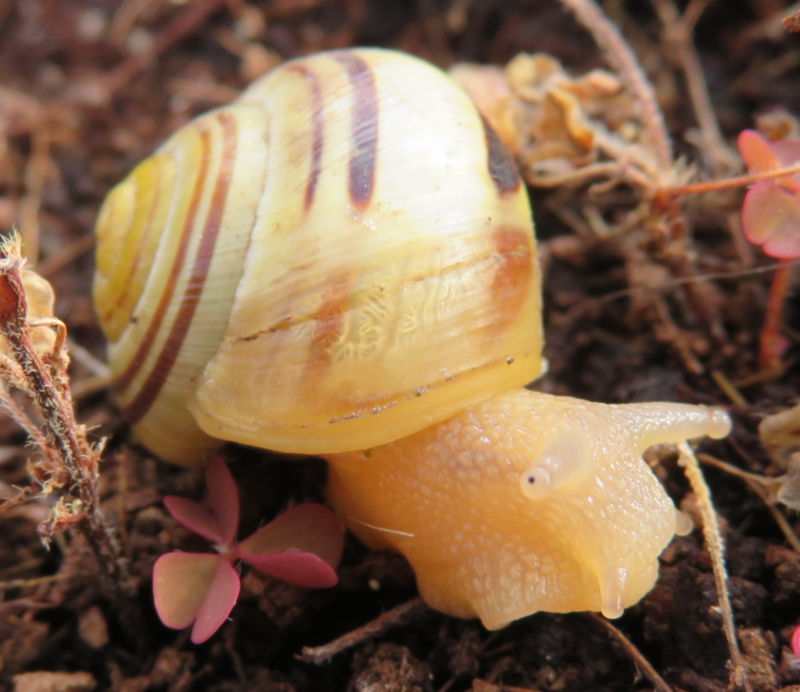 Malakazoologen sind diejenigen, die Schnecken bestimmen und untersuchen. Leider sind diese Zoologen bis heute eher Schnecken Leichenfledderer und „Häuslesammler“. 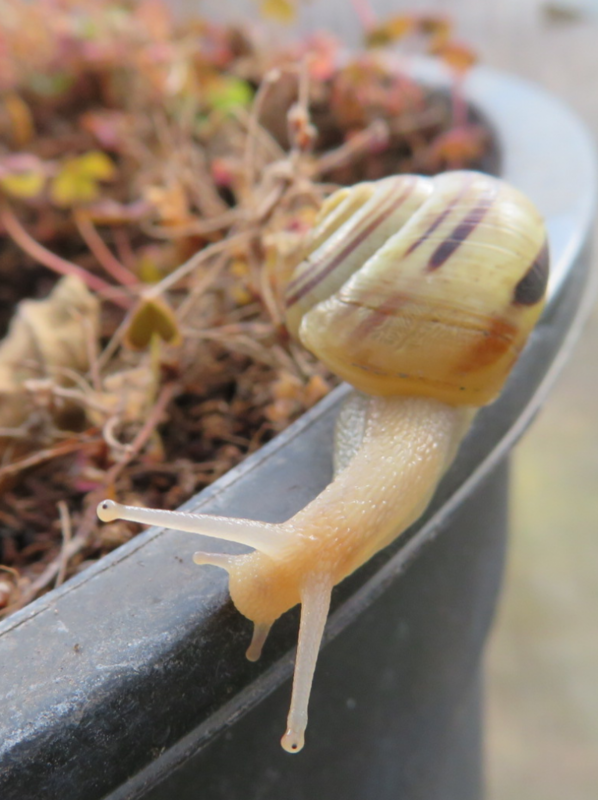 Jetzt wollte ich aber unsere einheimischen Schnecken bestimmen und fotografieren, ohne diese irgendwie zu stören. So kam mir die Idee, nach meinen umfassenden Untersuchungen mit dem Alpenveilchen, bei den Schnecken ebenso mit der DNA zu arbeiten. 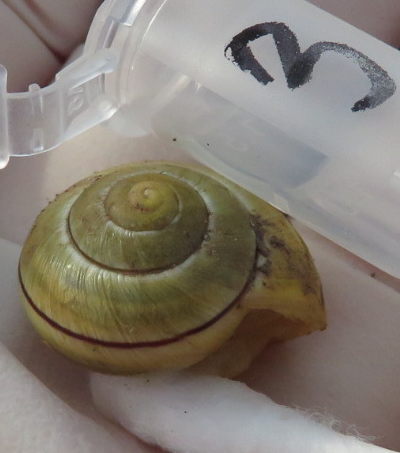 Durch Recherche fand ich, dass es eine umfassende Datenbank auf NCBI gibt über das 16S als Marker für verschiedene Schnecken (1). In meinem Labor benutze ich grundsätzlich keine giftigen Chemikalien wie Phenol, Mecaptoethanol oder Chloroform, die man normaler Weise zum Aufreinigen von DNA verwendet. 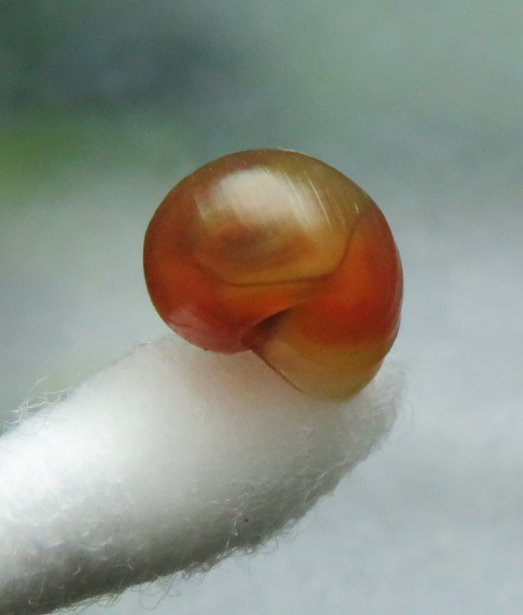 Deshalb habe ich ein Protokoll entwickelt, das für Schnecken funktioniert ohne diese auf irgend eine Weise zu verletzten oder diese Chemikalien zu verwenden. Ich habe ziemlich viel Zeit in dieses Protokoll investiert und will es hier gerne mit interessierten Menschen teilen. Ausgangsmaterial ist ein Abstrich mit einem Wattestab (Swab). 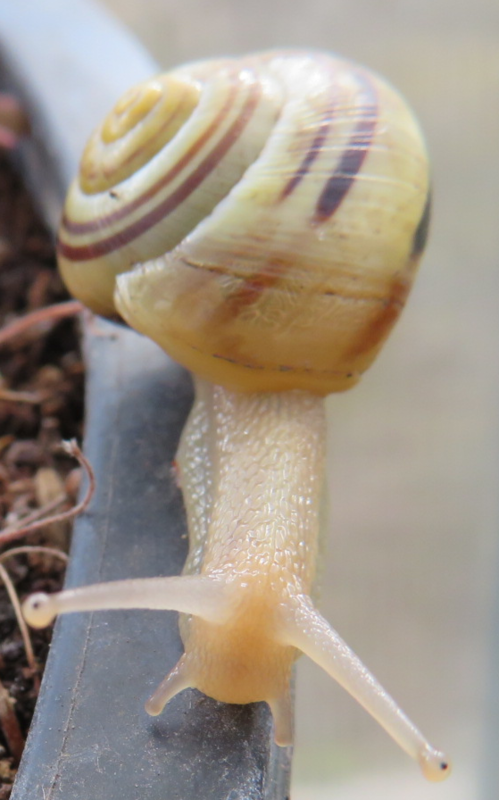 Hierbei wird sich die Schnecke zurück ziehen, das macht aber nichts. Dann kommt der Kopf vom Swab in ein Eppi. Je Eppi nehme ich 800 µl HS Buffer, plus 100 µl SDS (10%), plus 20 µl DTT, plus 40 µl Proteinase K und plus 20 µl RNAse. 5 g DTT in 32,4 ml H2O oder 1M. Bei 20°C lagern. Das ganze wird vorsichtig gemischt und kommt bei 50°- 55°C für vier Stunden in den Heizblock. Ab- und an das Eppi bisschen bewegen. Dann kommt das Eppi für 3 Minuten in die Zentrifuge mit Vollspeed. 700 µl vom Überstand kommen mit 600 µl Isopropanol in ein neues Eppi und werden vorsichtig gemischt. Das alles bei Raumtemperatur! Dann wird die DNA 5 Minuten bei 12 K rpm abzentrifugiert. Nicht zu lange oder zu kalt, sonst kommt unerwünschtes irgendwas mit. 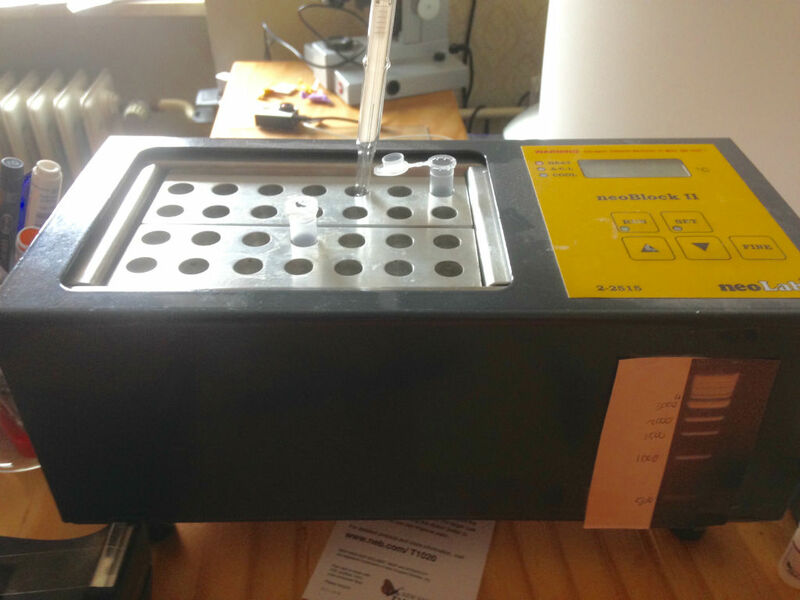 Danach kann man das Pellet 2 x mit 70% EtOH waschen, trocknen und in 20 µl TE oder H2O auflösen. 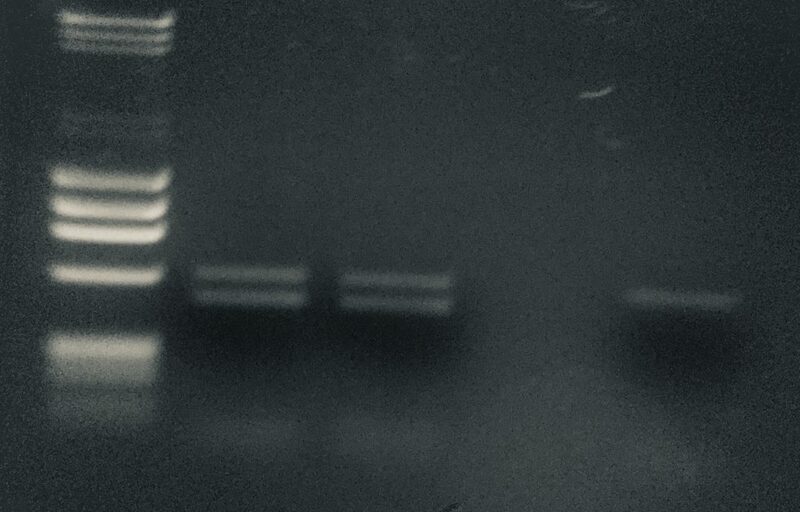 Falls die PCR später nicht funktioniert, kann das am ehesten an der DNA liegen. Natürlich nur, wenn man sich mit den Primern sicher ist. Hier empfiehlt sich eine positiv Kontrolle. Probleme mit der DNA kommt oft von der Proteinase K. Meiner Erfahrung nach kann man da mit der Konzentration und der Verdauzeit eher hoch gehen, als runter. 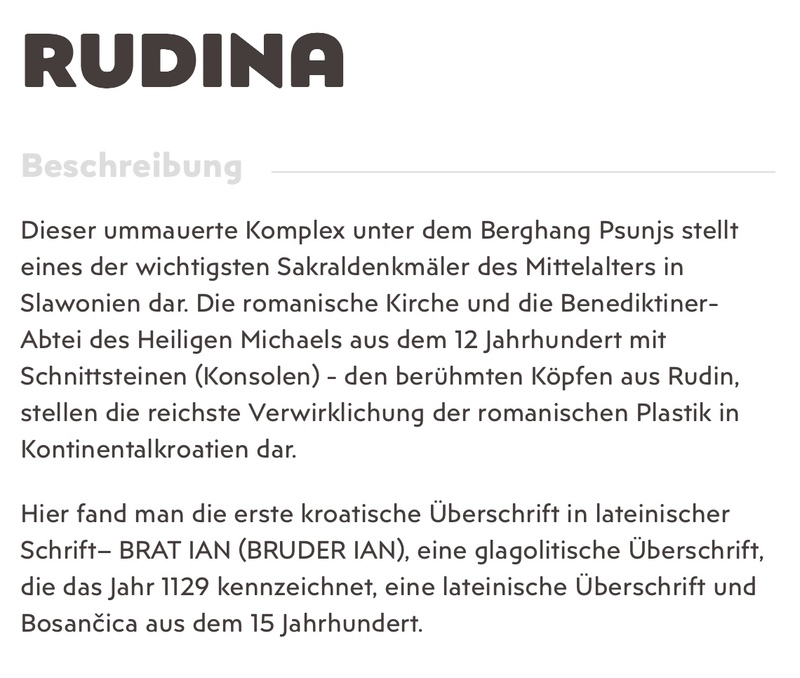 Wichtig ist auch ein guter RNA Verdau. RNA kann auch die PCR stören. Die Bande wird ausgeschnitten, mit dem Monarch DNA kit von New England Labs aufgereinigt, bei GATC in Köln mit Primer HM103 sequenziert und die Sequenz mit NCBI Blast abgeglichen. 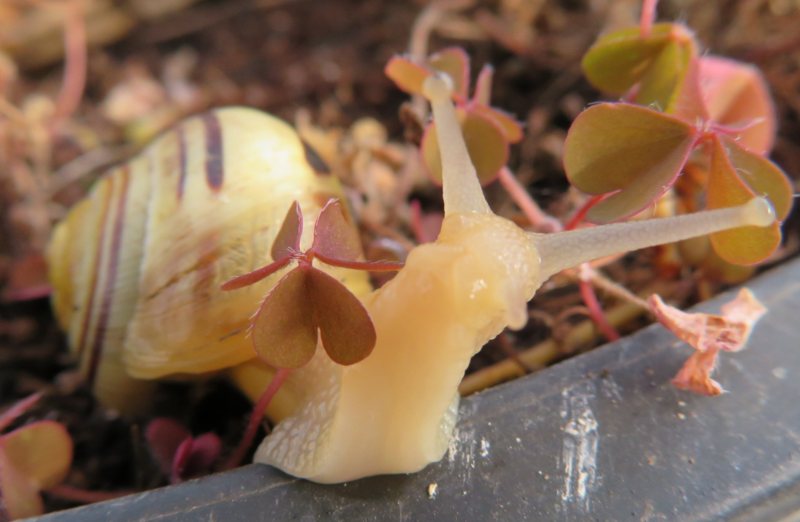 Hier das Ergebnis mit meinem ersten Versuch, der oben abgebildeten Posthornschnecke. This entry was posted in Allgemein on 22. Februar 2019 by hannahadmin. Cyclamen purpurascens (Alpine, European or purple cyclamen) is native to central Europe. Since decades it is discussed wether the occurrences of C. purpurascens north of the alps is native or if it was introduced. Here the nuclear ribosomal DNAs (rDNA) are sequenced in oder to obtain a phylogenetic geographic pattern. 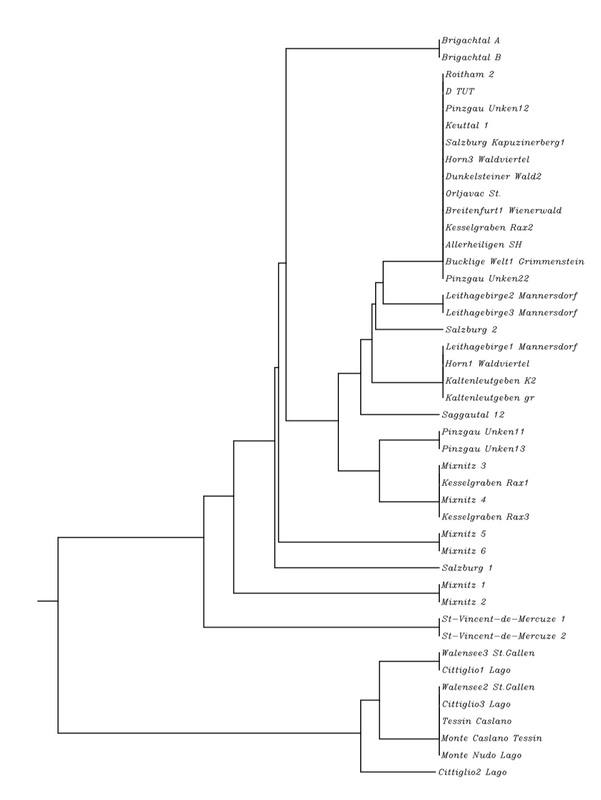 Phylogenetic analyses of ITS and NTS/ETS sequences distinguish three main clades coinciding with geographical distribution: Eastern alps (Austria), southern alps (Switzerland, Italy) and western Alps (France). The paper presents interspecific relationship of C. purpurascens based on geographic sequences of rDNA. The observed variations suggest that some plants were introduced via Benedictine gardens and the plants from Monastery gardens seem to origin from Lower Austria. Cyclamen purpurascens (Alpine, European or purple cyclamen) is a species in the genus Cyclamen of the family Myrsinaceae, formerly Primulaceae, and is native to central Europe from eastern France across the Alps to Slovakia and south to Croatia. North of the alps there are some occurrences of C. purpurascens like in southwest Germany (Mühlheim, Kisslegg, Salem, Brigachtal) and Switzerland (Schaffhausen) . Welten & Sutter recorded the Jura to Oensingen (Mümliswil), Lake Lucerne and the Upper Lake Zurich as the next environs . Since decades it is discussed wether the occurrences of C. purpurascens north of the alps is native or if it was introduced. In 2011 Slovak et al. 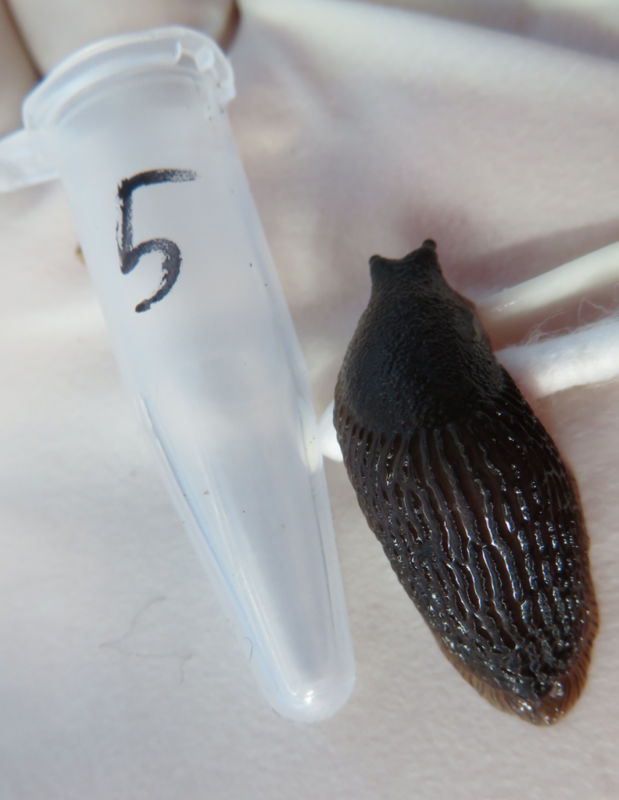 published an interesting paper about sequencing noncoding DNA regions of C. purpurascens to distinguish geographic origins . Unfortunately the polymorphisms in the sequenced regions were too low to generate an useful mapping. Nevertheless the idea of geographic mapping by sequencing of specific DNA regions seems to be challenging but also fascinating. Since chloroplast DNA sequences don’t give enough data for phylogenetic analysis of C. purpurascens we investigated different approaches. In an analysis of phylogenetic interrelationships of the genus Cyclamen L., Anderberg et al. 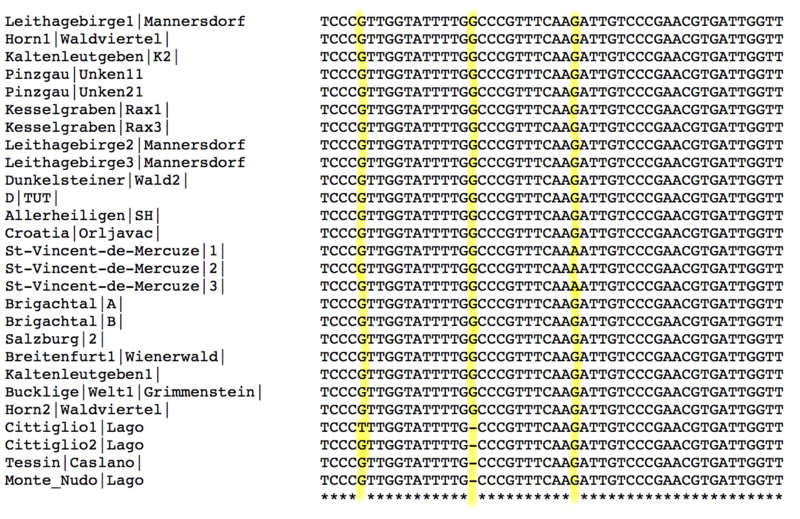 sequenced the internal transcribed spacers of nuclear ribosomal DNA . Ribosomal DNA (rDNA) consists of a tandem repeat of an operon, composed of non-transcribed spacer (NTS), external transcribed spacer (ETS), 18S, internal transcribed spacer 1 (ITS1), 5.8S, internal transcribed spacer 2 (ITS2) and 26S tracts (Fig 1). In preliminary studies we could find some variations not just in ITS1 and ITS2, but also upstream of 18S in the region of NTS/ETS in C. purpurascens from different geographic regions. The aim of this study was to investigate the sequence of the NTS/ETS, ITS1 and ITS2 to do a geographic mapping of C. purpurascens. For this we collected and sequenced 97 leaves of alpine cyclamen of different geographical origin. A total of 97 leaves of C. purpurascens from different geographic origins were collected and rDNA was sequenced (Fig 2; Table 1). Fig 2. Map of central Europe. Analyzed samples an their voucher numbers are indicated in red. Plant materials used. Region, voucher information, localities and GenBank accession numbers are indicated. DNA sequences from the ribosomal DNA were used for the present analysis. Ribosomal DNA (rDNA) consists of a tandem repeat of an operon, composed of non-transcribed spacer (NTS), external transcribed spacer (ETS), 18S, internal transcribed spacer 1 (ITS1), 5.8S, internal transcribed spacer 2 (ITS2) and 26S tracts. The spacers are regions within the nuclear ribosomal DNA gene that separates the 18S, 5.8 S and 26S genes. The ITS1 and ITS2 regions have been used in several phylogenetic reconstructions and proved to be variable to a suitable degree for investigations . Here we also analyzed the NTS/ETS region (Fig 1). Fig 1. Schematic representation of ribosomal DNA (rDNA). 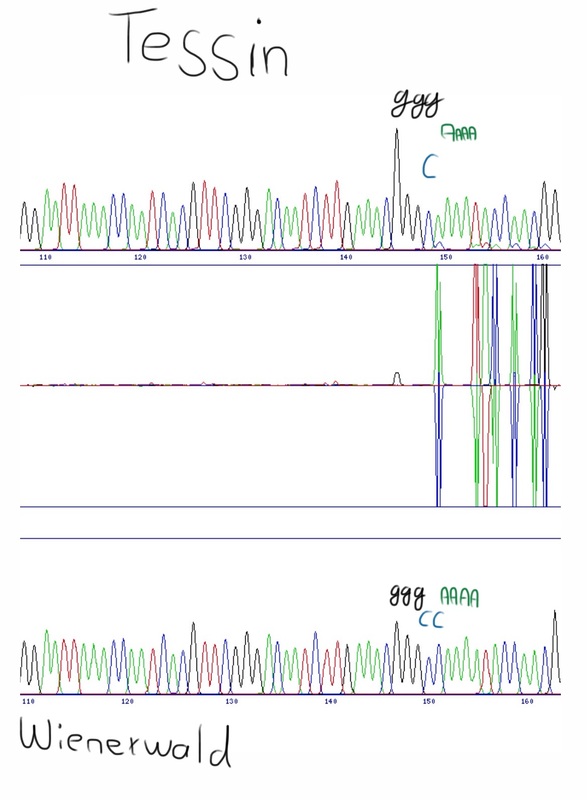 C. purpurascens rDNA of NTS/ETS, 18S, ITS1, 5.8S and ITS2 is a part of a tandem repetitive cluster of 3155 basepairs. The rDNA contains NTS/ETS of ~600 basepairs, 18S of ~1800 basepairs, ITS1/5.8S/ITS2 of ~660 basepairs and 26S. 50 mg of leave material was grinded in 1 ml buffer HS (10 mM Tris-HCl, pH 7.6, 10 mM KCl, 10 mM MgCl2, 400 mM NaCl, 2 mM EDTA, 1% SDS, 0,1 mM DTT, 20 µg Proteinase K, 10 µg RNAse) and incubated for 3 hours at 50°C. Debris was collected by centrifugation and DNA was precipitated with isopropanol and washed with 70% EtOH. Genomic DNA was also purified with columns from Roti Prep Genomic DNA kit from Roth. 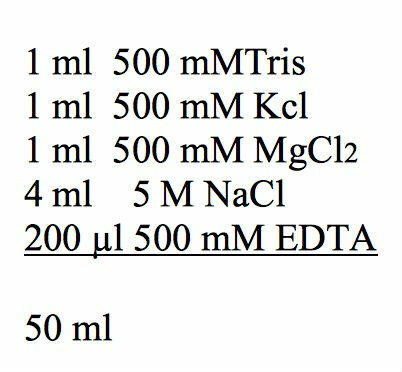 PCR was performed with Polymerases (One Taq or Phusion) from New England BioLabs and primers indicated in Table 2. Temperatures were calculated with Tm Calculator from New England BioLabs. NTS/ETS was amplified with primer HM95/HM96.18S was amplified with primer HM84/93, HM92/89 and HM94/93. ITS1/5.8S/ITS2 with primer HM102/HM82 or HM81/HM82. PCR products were gel purified with Monarch DNA Gel Extraction Kit from New England BioLabs and sequenced. 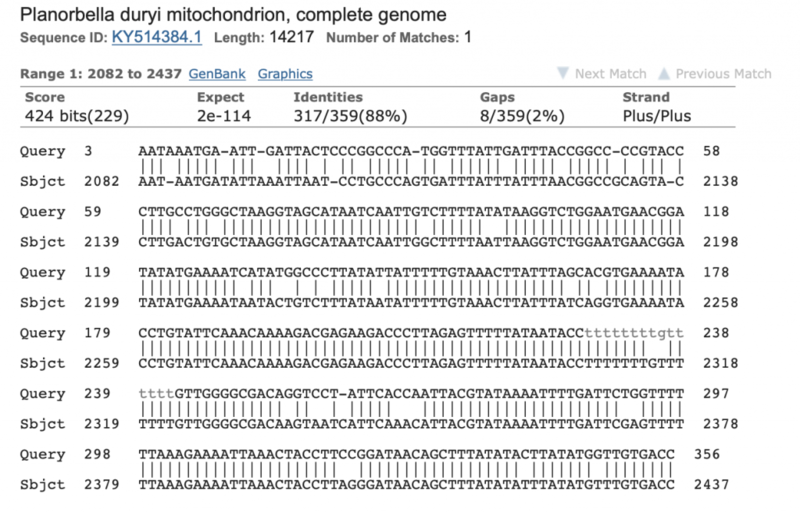 The PCR product of NTS/ETS was sequenced with primes HM96, HM100 or HM 95. 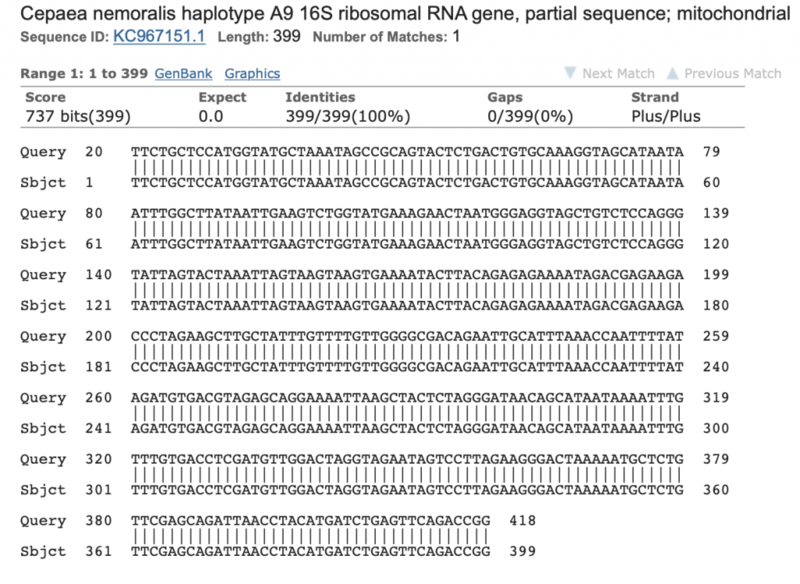 The PCR product of 18 S was sequenced with primers HM 84, HM93, HM92, HM89, HM94. 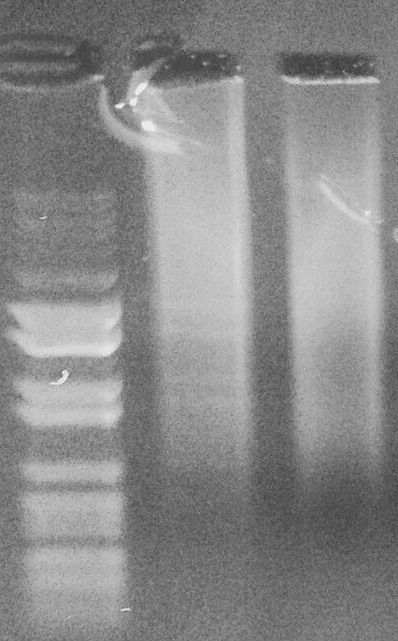 The PCR product of ITS1/5.8S/ITS2 was sequenced with primes HM78, HM82 or HM79. Sequencing was performed by GATC Biotech (now Eurofins Genomics) in Cologne. Sequences were analyzed by Multiple Sequence Alignment by CLUSTALW, Kyoto Bioinformatics Center and SeqDoC by the Bioinformatics Facility of the ARC Special Research Centre for Functional and Applied Genomics. Table 2. Primers Primers used for this study. We sequenced 97 leaves of different geographical origin of C. purpurascens in the region of NTS/ETS and ITS1/5.8S/ITS2 (Table 1; Fig 1 and 2). 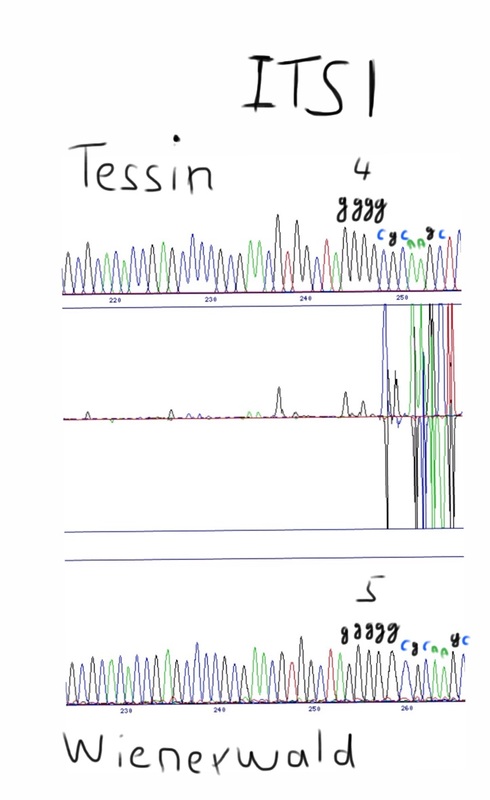 Multiple sequence alignment was done with the 3155 basepair rDNA region (Fig 1). For a better overview some similar sequences were omitted. Also five too divergent sequences were omitted. This were one sequence from Unken (Pinzgau), one from Salzburg, two from Styria and one from Arcumeggia (Italy). 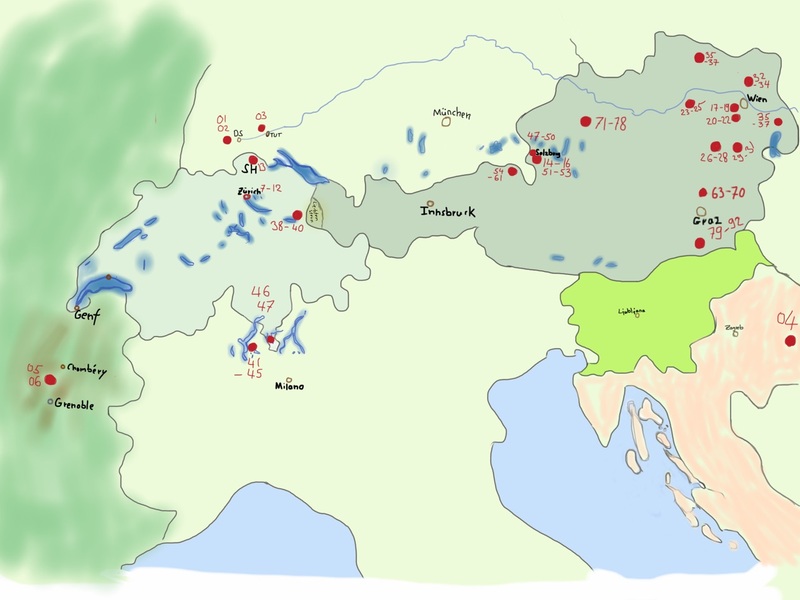 Plants from Switzerland (Walensee, St. Gallen and Monte Caslano, Lake Lugano, Schaffhausen) are related to the plants collected in Italy (region Lake Maggiore). Another cluster could be found with three plants from France (St. Vincent de Mercuse, Isère, North of Grenoble). In Austria plants get more diverse in the analyzed rDNA region, the farer we collect samples from Lower Austria (Fig 3). So plants from Styria (Mixnitz) and also from Pinzgau (Unken) are highly diverse. Surprisingly leaves collected in Lower and Upper Austria are very much conserved in the region of NTS/ETS/18S/ITS1/5.8S/ITS2. This conserved sequence could also be found in some plants from Salzburg, in a sample from Schaffhausen (Switzerland), Mühlheim an der Donau (Germany) and also from Orljavac (Croatia). The conserved sequence could not be found in the plants from Brigachtal (Germany) and from Schleitheim (Schaffhausen, Switzerland). The plants with the conserved sequence similar to the region of Vienna are all growing close to Benedictine gardens. So the leaf from Schaffhausen was collected in the garden of the former abby Allerheiligen, Mühlheim an der Donau is close to Beuron Archabbey and near Orljavac was a Benedictine abbey of Saint Michael. Fig 3. Polygenetic tree of C. purpurascens from different geographic origins. Plants from Switzerland (Walensee, Monte Caslano, Schleitheim) are related to the plants collected in Italy (Cittiglio, Caslano, Monte Nudo). Another cluster could be found with plants from France (St. Vincent de Mercuse). In Austria plants get more diverse in the analyzed rDNA region, the farer from Vienna. Plants from Styria (Mixnitz) and also from Pinzgau (Unken) are highly diverse. Leaves collected in Lower and Upper Austria are very much conserved in the region of ETS/18S/ITS1/5.8S/ITS2. This conserved sequence could also be found in some plants from Salzburg, in samples from Schaffhausen, Mühlheim and also from Orljavac. It could not be found in the plants from Brigachtal and Schleitheim. Sequence alignment comparison of 50 bases in the ETS of 14 plants from different origins show the difference of plants from Switzerland , Italy , France and Austria. So all analyzed plants from Austria and France have an additional G (TGGCCC) which is missing in plants from Italy and Switzerland (TGCCC). 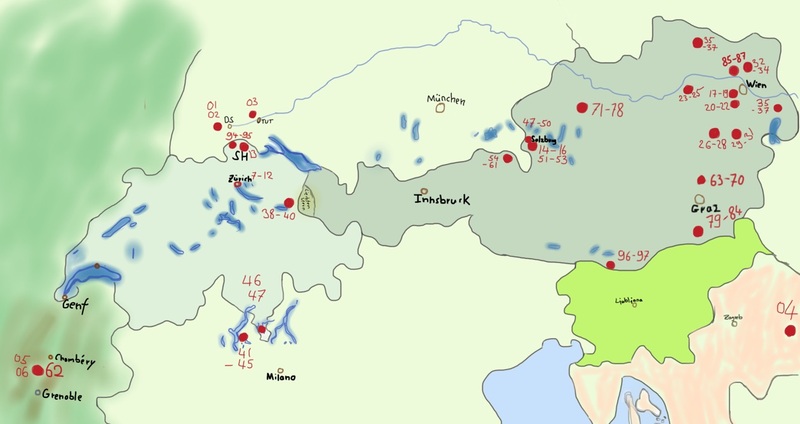 Nine bases downstream of this signal plants from France are having a unique signal of AAAA instead AAGA like the analyzed plants form Austria, Switzerland and Italy (Fig 4). Similar signals could be found in the ITS1 and ITS2 of the rDNA (data not shown). Fig 4. Sequence alignment of nt 100-150 in the NTS/ETS of selected plants. Plants from Italy and Switzerland show the signal TTGCC and plants from Austria and France TTGGCC. The plants from France can be distinguished 9 bases downstream by AAAA instead of AAGA in Austria, Italy and Switzerland. Downstream of this signals we could also find some single nucleotide differences in the region of ETS. Using two chromatograms, we aligned images of the two chromatograms. Here we compare nucleotide 100-500 of ETS of a leaf from Lower Austria to the corresponding sequence of a leaf from Cittiglio (Fig 5).The difference profile in the middle allows identification of base substitutions, insertions and deletions. As shown in Fig 5., at the 5′ are two G in the plant from Lower Austria and just one G in the plant from Italy. Downstream of this signal are 5 additional substitutions in the ETF of the two analyzed plants. Fig 5. Alignment of two chromatograms. Alignment of nucleotide 100-500 of ETS sequence from a plant from Lower Austria (upper lane) and one plant from Cittiglio, Italy (lower lane). The lane in the middle is showing the difference with one additional G in the sequence of the Lower Austria region and five C/T substitution. By sequencing the region of NTS/ETS/18S/ITS1/5.8S/ITS2 in the rDNA of C. purpurascens we could clearly distinguish the geographic region of the origin of the plant. So plants from Austria, Switzerland, Italy and France are having a unique signals in NTS/ETS, ITS1 and ITS2 (Fig 1, 3, 4, 5). rDNA of plants from Austria get more diverse the farer we collect samples from Vienna. So plants from Styria and also from Pinzgau are having several substitutions in the analyzed region. Leaves collected in Lower and Upper Austria are very much conserved in the region of NTS/ETS/18S/ITS1/5.8S/ITS2. This conserved sequence could also be found in some plants from Salzburg, in a sample from Schaffhausen (Switzerland), Mühlheim an der Donau (Germany) and also from Orljavac (Croatia). 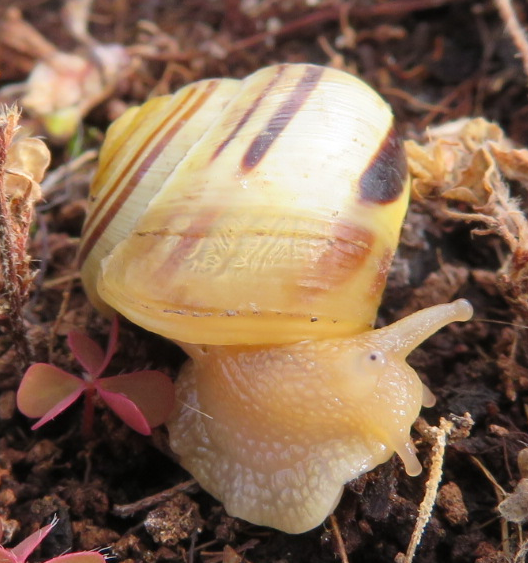 Surprisingly it could not be found in the plants from Brigachtal (Germany) and Schleitheim (Schaffhausen, Switzerland). The plants with the conserved sequence similar to the region of Vienna are all growing close to Benedictine gardens. So the leaf from Schaffhausen was collected in the garden of Allerheiligen, Mühlheim an der Donau is close to Beuron Archabbey and near Orljavac was a Benedictine abbey of Saint Michael. The Benedictines had as early as in the 6th century medicinal herb gardens and distributed many plants across the Alps. Salzburg was and is the center of the Benedictines with the abbey of St. Peter. Alpine cyclamen were called „Wolfgang Erdäpferl“ by the locals and was said to have a special effect on snakebite, migraine headaches and as a philter. The roots were sold to Pilgrims as salvation and fertility symbol . So we suggest that at some point C. purpurascens had to be replanted in the area of Salzburg. We assume that for this reintroduction people used plants from Benedictine gardens. 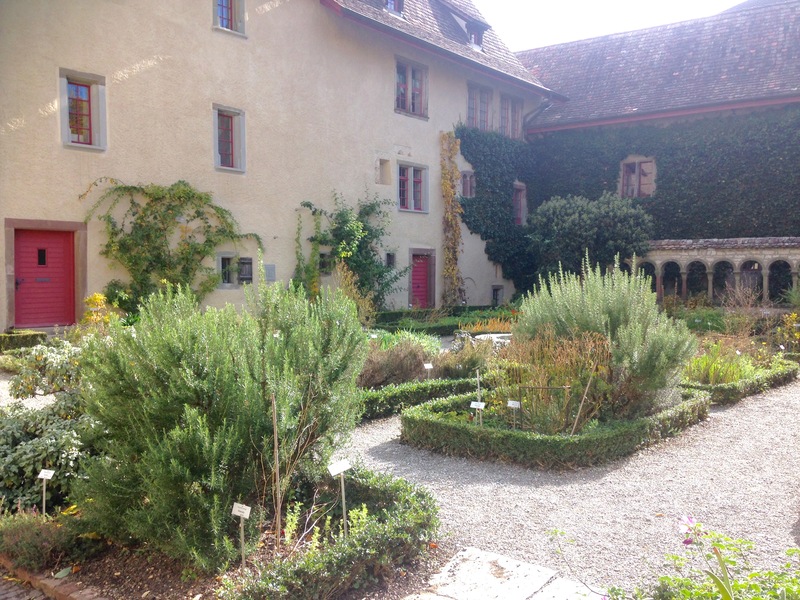 The plants from Monastery gardens seem to origin from the forests of Vienna. In the forests of Schleitheim in the Canton of Schaffhausen is another occurrence of C. purpurascens which was described in 1989 . The plants found in 1971 are very much related to plants in Switzerland. Unfortunately just beside this plants someone has planted some tubers from the Benedictine gardens. Although there are inflorescences it seems that no seeds germinated, not in Canton Schaffhausen and also not in Germany. That’s why there are just small patches of alpine cyclamen and they did not spread. Interestingly plants in canton Schaffhausen are not very close related to the C. purpurascens growing in Brigachtal which is just 30 km across the border. The plants in Brigachtal seem to relate very much to plants from Austria. But it is possible that alpine cyclamen are naive to limestone in Southern Black Forest / Schaffhausen region. Another very interesting region would be the Tatra Mountains in the Czech Republic which should be analyzed in further studies. Also molecular cytogenetic mapping of 5S and 35S rDNA loci was not addressed in this study and should be considered in future studies. 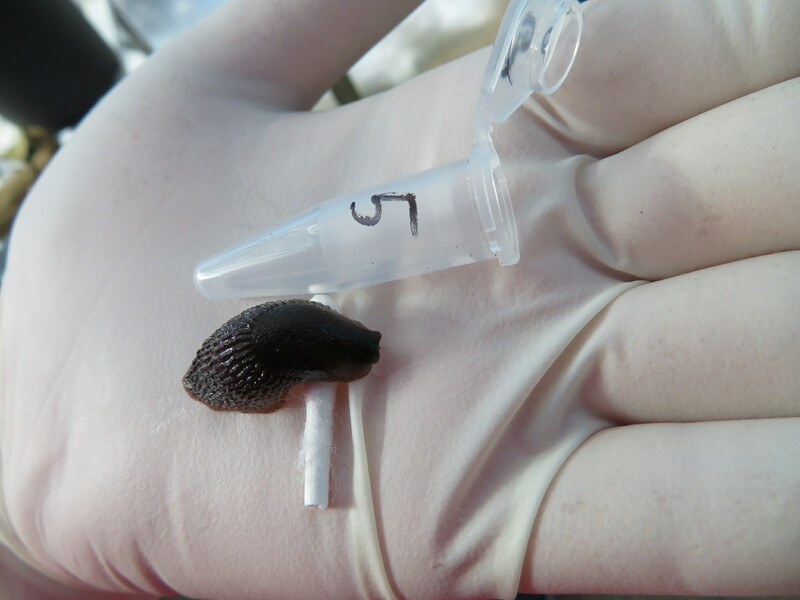 This is the first molecular analysis of the geographic origin of C. purpurascens. An evolutionary and geographically interpretation in a phylogenetic context has been possible. rDNA sequences are variable within the species and some regions show a specific patten. 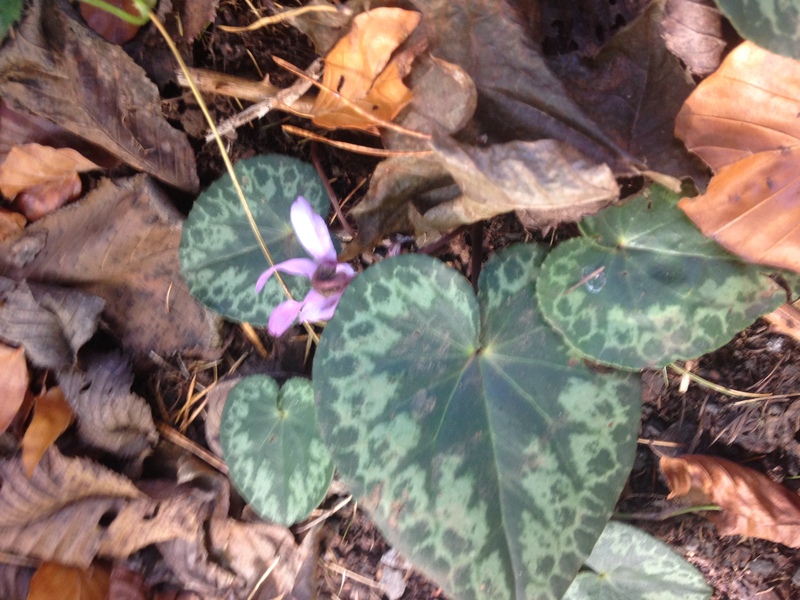 With this information it is possible to determine the geographic origin of alpine cyclamen and to hypothesizing if it is native or was introduced at some point. The author would like to thank the members of the Flora Austria (Verein zur Erforschung der Flora Österreichs) particularly Hermann Falkner, Stefan Lefnaer, Georg Pflugbeil, Markus Sabor, Michael Strudl and Maria Zacherl for sending leaves of C. purpurascens from all over Austria. Without their precious help this work would not have been possible. Many thanks to Petra Bachmann and Peter Braig of the Canton Schaffhausen and Peter Enz, garden manager at the Zurich Botanical Garden for their help. Thanks to Duca Jaag for the plant from Orljavac. This research was supported by Thomas Kring. The author received no specific funding for this work. 1. Keller W. Ist das Gemeine Alpenveilchen, Cyclamen purpurascens Mill., im Kanton Schaffhausen ursprünglich? Mitteilungen der Naturforschenden Gesellschaft Schaffhausen, 1998; 43: 25-33. 2. Welten M, Sutter R. Verbreitungsatlas der Farn- und Blütenpflanzen der Schweiz. 2 Bde., Basel, Boston, Stuttgart, Birkhäuser. 1982; 716: 698. 3. Slovak M, Kucera J, Turis P, Zozomova-Lithova J. Multiple glacial refugia and postglacial colonization routes inferred for a woodland geophyte, Cyclamen purpurascens: patterns concordant with the Pleistocene history of broadleaved and coniferous tree species. Biological Journal of the Linnean Society. 2012; 105: 741–760. 4. Anderberg AA, Trift I, Källersjö M. Phylogeny of Cyclamen L. (Primulaceae): Evidence from morphology and sequence data from the internal transcribed spacers of nuclear ribosomal DNA. Plant Systematics and Evolution. 2000; 220, 3–4: 147–160. This entry was posted in Allgemein on 10. Januar 2019 by hannahadmin. Es ist mir schon länger aufgefallen, dass alle Läuferblogs entweder von Männern geschrieben werden oder von jungen Frauen. Gerade Sportwissenschaftler scheinen fast ausschließlich Männer zu sein. Die paar Mädels die sich in den Gefilden rum treiben, sind meistens top fit, um die 20, höchstens 30 Jahre alt, und orientieren sich leider fast nur an ihren männlichen Kollegen. 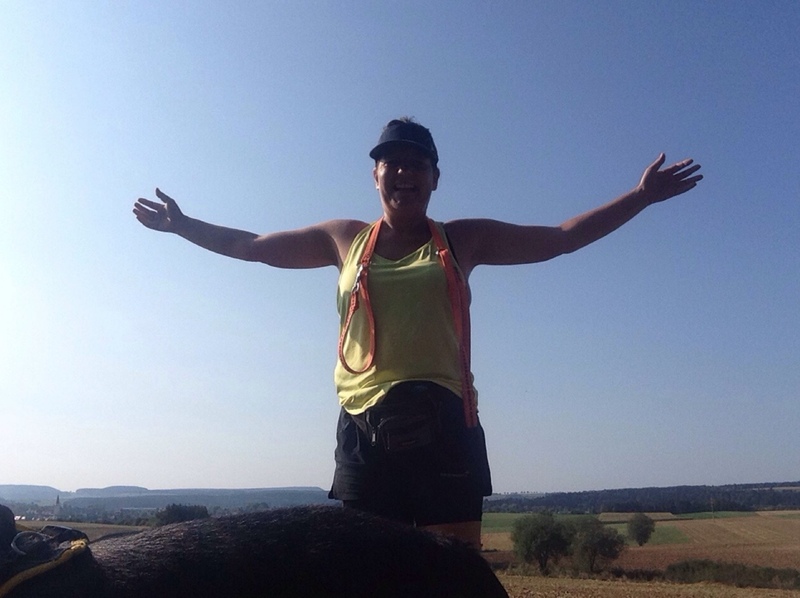 Du bist eine Frau in oder nach den Wechseljahren, Dein Körper tickt ganz anders als vor 30 oder 40 Jahren, aber Du willst trotzdem rennen, vielleicht auch mal einen Marathon, dann bist Du hier richtig. Egal aus welchem Grund Du laufen willst: Tu es! Das ist der beste Anfang. Es ist vollkommen unwichtig was man an hat. Ich bin am Anfang in Jeans und T-Shirt gelaufen. Einfach so, beim spazieren gehen bisschen gerannt, immer öfters, immer länger, wie ich wollte. Am liebsten, wenn mich keiner gesehen hat. 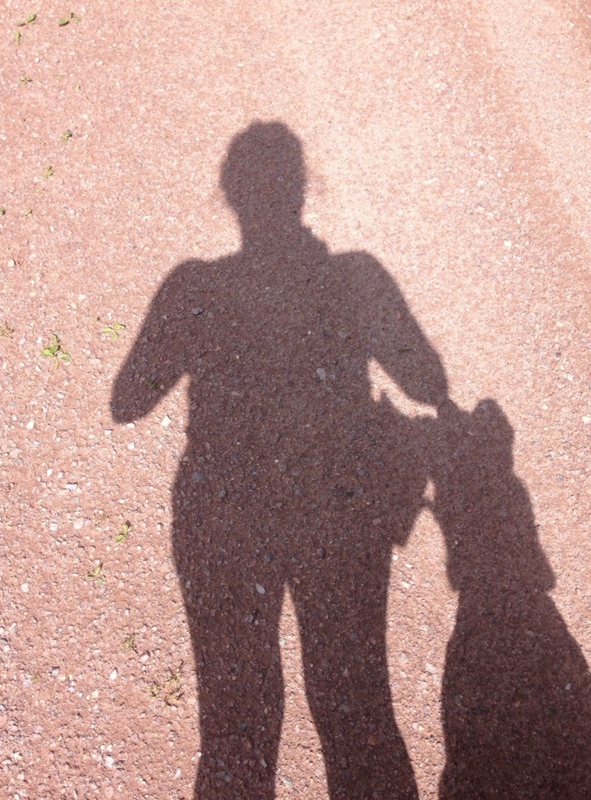 Es erfordert nämlich doch etwas Selbstbewusstsein als ältere Frau in fancy Sportbekleidung durch Stadt oder Dorf zu rennen. Wenn man unterwegs von jemandem dumm angemacht wird, trifft einen das meistens wie ein Blitzschlag. Zuerst versteht man gar nicht was los ist, dann kapiert man es langsam, reagiert irgendwie und später ärgert man sich über seine Reaktion. Womöglich steckt der Ärger so tief, dass der nächste Mensch der die gleichen Symbole bei sich hat (z.B. ein Fahrrad, eine Brille, rote Haare, Bart etc.) völlig unschuldig den Ärger ab bekommt. Damit tragen wir die schlechte Laune weiter und sind selber griesgrämig. Zuerst mal, behandelt alle fremden Menschen sofort wie Freunde. Wenn der Bauer mit dem Traktor kommt, geht möglichst weit aus dem Weg und grüßt freundlich. Ja, man kann dem Bauern winken, er freut sich. Bedenkt, der Bauer ist im Arbeitsmodus und sieht euch im Freizeitmodus. Er hat es eilig. Wenn ihr ihm Platz macht und freundlich winkt, fühlt er sich wertgeschätzt. An der nächsten Joggerin wird er nicht missmutig vorbei donnern. Klar es gibt Rückschläge. Ich wollte mal eine ältere Dame mit Beaglehündin freundlich grüßen. Schaue ihr ins Gesicht , lache und holte gerade Luft, da schreit sie mich an: „Das ist nicht lustig“. O.k. Ich habe die Dame nicht gegrüßt, mir ihr Gesicht gemerkt und sie nie wieder gegrüßt. Sie ist keine Fremde mehr. Sie ist die alte Dame, die ich ignoriere. 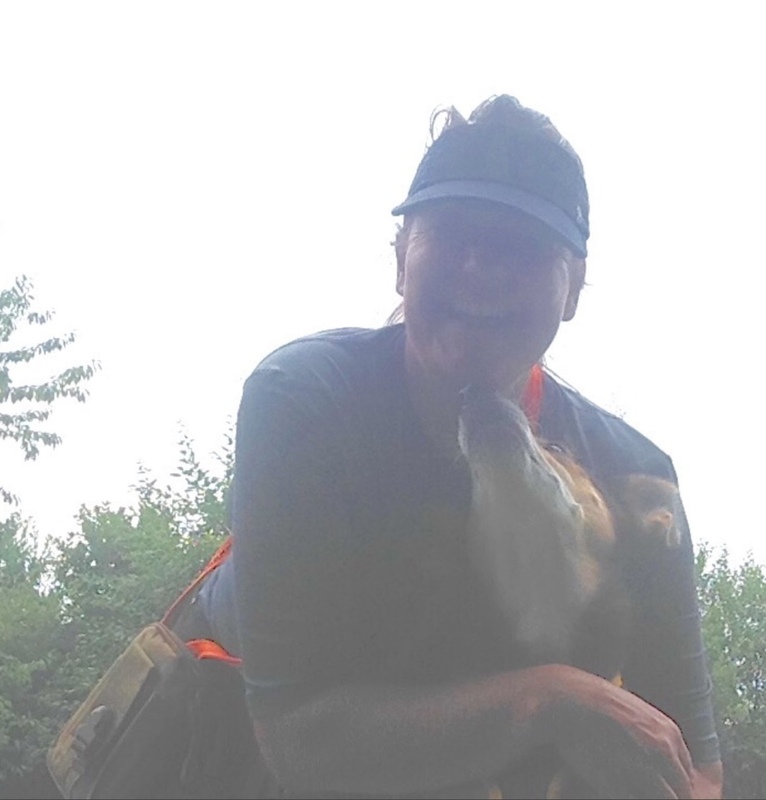 Eine fremde Dame mit Beagle werde ich wieder freundlich grüßen und vielleicht mit ihr reden. Die Strategie habe ich mir überlegt, als in einem Frühjahr auf einmal zwei unhöfliche Radfahrer unterwegs waren. Der erste brüllte mir spontan ins Gesicht „Scheiß Köter“ – obwohl meine Hundine etwa drei Meter neben dem Weg durchs Gras lief. Ein zweiter fuhr auf dem Fußweg mittig mit dem Rad und sagte mir „verpiss Dich“ – in dem Fall war Hundine sogar an der Leine, er meinte wohl auch mich, die blöde Joggerin. Kurz später kam der dritte Radfahrer. Ich gucke ihn böse an in Erwartung einer neuen Beleidigung und laufe mitten auf dem Weg. Der Mensch hält an, grüßt freundlich und wir plaudern kurz über das schöne Wetter. Danach ärgere ich mich über meine Unhöflichkeit. Ich hatte meinen Ärger auf alle Fahrradfahrer übertragen. So entstehen Vorurteile. Da habe ich mir meine Strategie des Hinschauens und Ignorierens überlegt. Sie ist im Prinzip einfach. Alle Fremde werden wie Freunde behandelt. Ich lache, grüße sie und rede mit ihnen. Falls eine Beleidigung kommt, schaue ich dem Menschen direkt ins Gesicht. Ich merke mir seine Fresse. Schaue ganz genau hin. In die bösen Augen, seine Nase, sein Gesicht. Ich präge mir den bösen Menschen ein, nicht das womit man ihn zu irgend etwas zuordnen kann. Nur diesen einen speziellen Menschen. Dieser eine Mensch wird in die Schublade der bösen Menschen gelegt. In die Schublade kommt nur er, keine Gruppe Menschen die ähnlich sind. Das ist schwierig, aber nicht unlösbar. Es ist wichtig nichts zu sagen. Mit dummen Menschen redet man nicht. Man schaut hin ja, aber man redet nicht damit. Es ist sinnlos und treibt einen nur mit in den Strudel. Laßt ihn reden, aber schaut hin. Ganz genau. Das schöne daran ist, dass ihn das auch noch ärgert, Euer Schauen und nicht Reagieren. Denkt euch „Mit Idioten rede ich nicht“ und geht weiter. Dann lacht und seid zum nächsten Menschen wieder nett. Er sieht ganz anders aus und ist sicher eine wertvolle Bekanntschaft. This entry was posted in Allgemein on 13. September 2018 by hannahadmin. Wenn man bei den Läufern schaut, scheint die Herzfrequenz, also der Puls, wahnsinnig interessant zu sein. Die Sportler untertrumpfen sich mit einem Ruhepuls um die 40 und gehen dann rauf auf Spitzenwerte weit über 200. Dies alles ist für uns alte Weiber nicht mehr erreichbar, aber wir wollen ja auf dem Sofa liegend kein Herzrasen vom Wackeln mit dem großen Zeh bekommen. Deshalb ist Laufen (und auch Schwimmen oder Radfahren) wichtig. Erst mal will ich darauf hin weisen, dass der Gang zu einem Sportarzt oder zumindest einer Kardiologin vor einem regelmäßigen Training wichtig ist. Dieser Blog ersetzt keinen Arzt und auch keine Ärztin und spiegelt lediglich meine persönliche, subjektive Erfahrung wieder. Der Ruhepuls misst die Herzschläge in 60 Sekunden und wird am besten morgens vor dem Aufstehen gemessen. Die maximale Herzfrequenz kann eigentlich nur von einem Arzt bestimmt werden und bezeichnet die Anzahl der Schläge, die Dein Herz maximal bei Belastung in einer Minute erreichen kann. Die Zahlen sind individuell sehr verschieden und geben nur einen Anhaltswert wieder. 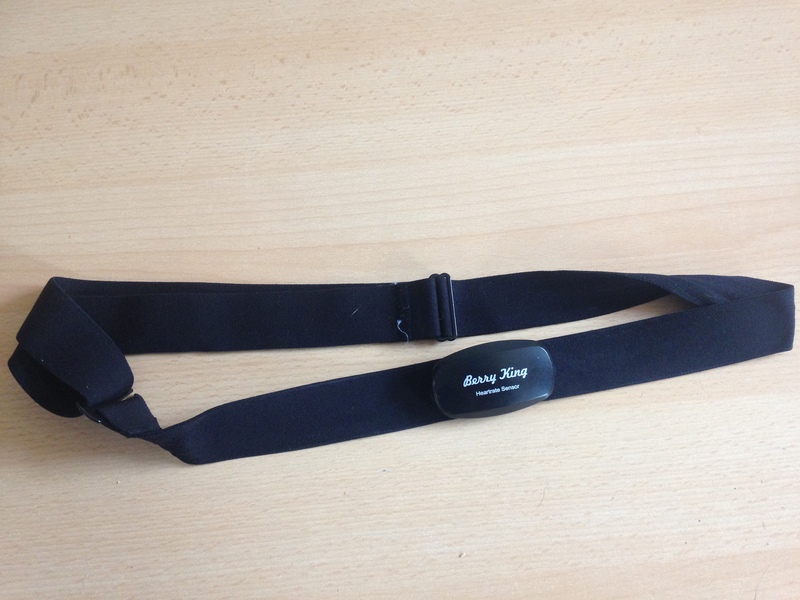 Grob kann man sagen, dass Ausdauersportler einen niedrigen Ruhepuls haben und dass im Alter der Puls und vor allem die maximale Herzfrequenz niedriger wird. Allerdings stimmt dies nur für den maximalen Puls bei Belastung und nicht für die Wechseljahre – na ja, zumindest meistens nicht. Ein hoher Puls und auch Herzrasen ist in den Wechseljahren häufig. Leider geht dies bei manchen Frauen mit Beschwerden wie Beklemmungen, Angstzuständen und sogar Depressionen einher. Genau aus diesem Grund wird hier Sport empfohlen. Regelmäßiger Sport wirkt sich positiv auf die Herzfrequenz aus und verhindert das sinnlose Herzrasen. Falls Du trotz regelmäßigem Laufen während des Laufens Herzrasen hast, dann suche bitte unbedingt eine Kardiologin oder Sportärztin auf. Du kannst Deinen Puls ganz einfach mit den Fingern fühlen und mitzählen. Ob Du dies jetzt am Handgelenk oder an der Halsschlagader tust und 15 Sekunden mal vier nimmst, oder eine ganze Minute zählst, ist vollkommen egal. Gefährlich wird es erst, wenn Dein Puls dauerhaft deutlich über 90 Schläge pro Minute ist. Es ist kein Problem, wenn der Ruhepuls trotz Sport über 70 liegt. Zum Messen gibt es dann Uhren, Brustgurt oder auch Dinger für die Ohren. Mir persönlich sind gute Uhren (noch) zu teuer. Deshalb habe ich mich für die deutlich billigere und auch zuverlässige Variante eines Brutgutes entschieden. Sowas gibt es für etwa 30 Euro und man kann ihn mit dem Smartphone verbinden. Aber so richtig wichtig ist so ein Teil natürlich nicht. Es geht durchaus auch ohne. Aber wer gene misst und analysiert hat natürlich Spaß an so einem Teil. Bei uns Frauen spielen die Hormone eine große Rolle. Wenn also das Progesteron weniger wird, geht der Puls rauf. Auch dürfen wir nicht vergessen, dass die Östrogene, die früher unser Herz und unsere Gefäße geschützt haben nun deutlich weniger werden. Also vieles was früher kein Problem war, wird heute zum Problem. Aber es sind nicht nur die Hormone, die unser Herz beeinflussen, auch der Elektrolythaushalt – also die Mineralstoffe – spielen eine wichtige Rolle. Ist dieses Gleichgewicht gestört, reagieren vor allem Frauen gerne mit Herzrasen. Hier sind natürlich Faktoren wie Ernährung und genug Wasser sehr wichtig. Aber gerade im Sommer, wenn wir verstärkt schwitzen, kommt das Gleichgewicht durcheinander. Wenn wir zu viel Wasser verlieren, wird das Blut dicker und das Herz kompensiert das. Die rote Linie ist die Herzfrequenz. Durch Überhitzung und zu starkes Schwitzen geht sie kurzfristig aussergewöhnlich stark hoch. Was uns so etwas sagt ist, dass wir es übertrieben haben. Eine gesunde Frau fällt deshalb nicht gleich tot um, sollte das aber nicht regelmäßig machen und in Zukunft solche Spitzten vermeiden. Wer viel schwitzt sollte auf jeden Fall auch Magnesium im Auge behalten. Viel Bananen essen ist sicher gut, reicht aber bei Läuferinnen vor allem im Sommer nicht aus. Mit der Zeit lernst Du Deine persönlichen Herzfrequenzbereiche besser kennen. Veränderungen sieht man mit der Zeit und auch, wenn man es mit den Training übertrieben hat. Wir alte Damen werden kaum über 170 kommen, auch sollten wir bei langen Läufen möglichst deutlich unter 130 bleiben. Das merkt man aber auch ohne Messgerät. Ein Mädel hat mal gesagt, dass man noch locker singen können muss, dann stimmt auch die Herzfrequenz. Probiert es aus. Lauft singend durch den Wald, unterhaltet euch mit Fremden und vor allem ärgert euch nicht. This entry was posted in Allgemein on 11. September 2018 by hannahadmin. Laufen macht Spaß, schnell laufen macht noch mehr Spaß, schnell und lange laufen macht super Spaß. Wenn es Dir auch Spaß macht und Du nicht mehr ein junges Mädchen bist, dann interessiert Dich vielleicht mein Sammelsurium hier. Wir sind keine junge Mädchen mehr und die Zeiten in denen wir das männliche Imponiergehabe zu ertragen hatten, sind zum Glück vorbei. Allerdings reizt eine reife Frau so manchen Zeitgenossen seine Misogynie oder schlechte Laune mal spontan auszuüben. Deshalb ist es gut für Deine Laune Dir vorher eine Reaktion zurecht zu legen. Ich werde hier kurz darlegen was meine Strategie gegen misogyne, dumme und böse Menschen ist. Dies verhindert zwar nicht bösartige Menschen, aber sie bewirkt, dass Du nicht mit hinein gezogen wirst in den Strudel der Misanthropie. Wer regelmäßig läuft, dem stellt sich früher oder später die Frage der richtigen Schuhe. Vor allem wer unter Hallux, schiefen Zehen, Knie- oder Hüftschmerzen leidet. 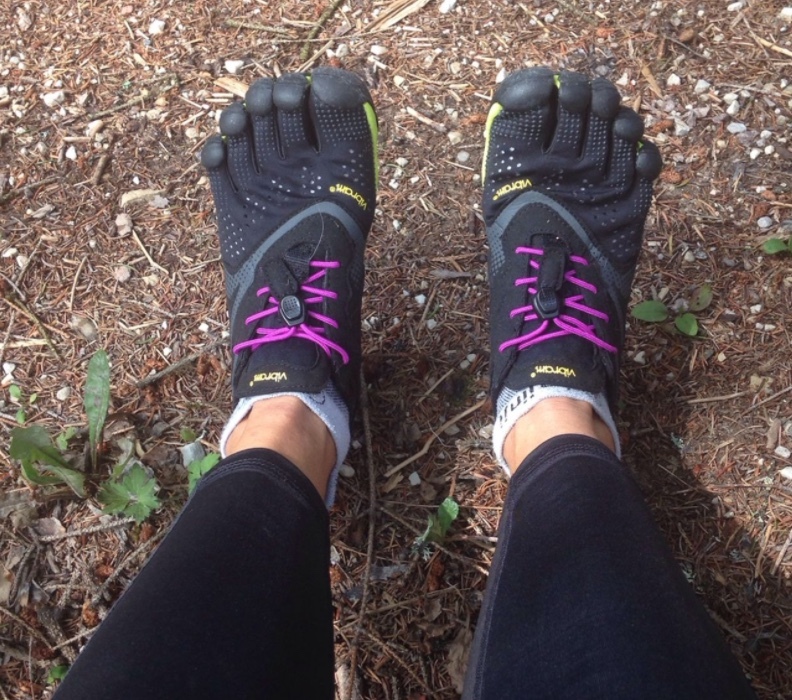 Ich habe für mich trotz – oder wegen – schmerzendem Großzehengrundgelenk für Vibram entschieden. Schon 2016 habe ich einen Artikel zu den Barfußlaufschuhen geschrieben und ihn jetzt hier etwas angepasst. Ein großes Thema ist die Ernährung, die Nährstoffe und Mikronährstoffe. Seit neuestem wollen uns die Medien ja ausserhalb der Werbeblöcke weiß machen, dass wir bei gesunder Ernährung gar nichts bräuchten. Das stimmt für junge Menschen die keinen Sport machen bedingt, nicht für viele Frauen und für ältere Menschen schon gar nicht. Wir aber wollen fit bleiben und unseren körperlichen Verfall zumindest verlangsamen. Dies verlangt, dass wir uns ganz genau mit den Nährstoffen auseinander setzten. Wir leben aus ethischen Gründen seit über 10 Jahren nahezu bio vegan und absolut vegetarisch. Zusammen mit Ausdauersport benötigt dies ein solides Wissen und ich bin bisher schon für einige Fehler bestraft worden. Als Läuferin merkt man schnell, wenn wo was klemmt. Und nein, es ist nie „das Alter“, es gibt eine (oder mehrere) Ursache, die es zu finden gilt. Bei Gelegenheit werde ich hier einen Artikel dazu schreiben. Momentan fehlt mir noch die Zeit, da ja ordentlich dazu recherchiert sein muss. Bis dahin nur kurz vorweg: Eisenspiegel in einem Blutbild checken zu lassen ist Pflicht für alle Frauen. Eisen ist ein Schwermetall und sollte nicht einfach so genommen werden. Wer einen Eisenmangel hat, liest vielleicht mal meinen Artikel über Lactoferrin. Dann ist Bananen essen gut und wichtig. Allerdings kann man bei Ausdauersport im Sommer mit Bananen den Magnesiumspiegel nicht aufrecht halten. Magnesiummangel ist doof und er äußert sich meist nicht mit Krämpfen. Zuviel Magnesium wird problemlos ausgeschieden und schadet nicht. Frauen müssen auf Jod achten! Die Schilddrüse kann Jodid verarbeiten, Brustdrüsen und Eierstöcke brauchen elementares Jod. Nein, keinen Schwermetall- oder Antibiotika-verseuchten Fisch essen. Algen sind das Zauberwort. Es gibt zum Beispiel Kelp mit genauen Nährwertangaben. Hilft auch bei Mineralstoffmangel und bei Krämpfen wegen Salzmangel im Sommer. Zuviel Jod ist auch bei manchen Menschen nicht gut. Informiert euch! Cyclamen purpurascens am Walensee im Kanton St. Gallen. Die rDNA kodiert die Gene für ribosomale RNA, also einen Großteil der Ribosomen. In eukaryotischen Zellen gibt es rDNA nicht nur im Zellkern, sondern auch in den Mitochondrien, und bei Pflanzen zusätzlich in den Plastiden. Dazu kommt, dass es ein Repeat ist, sich also ziemlich oft wiederholt. Dies alles verursacht bei der Sequenzierung Probleme, auf die ich hier nicht näher eingehen will. rDNA-Repeat der ribosomalen Untereinheiten. Der external transcribed spacer (ETS) und die internal transcribed spacer (ITS1 + ITS2) befinden sich zwischen den Transkriptionseinheiten. 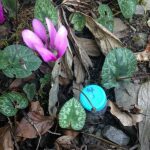 Vor allem mit Hilfe des Forum Flora Austria konnte ich viele verschiedene Blätter von Cyclamen purpurascens aus Österreich bekommen. An dieser Stelle nochmals vielen Dank an alle Beteiligten! Ihr habt mich einen großen Schritt weiter gebracht. Die roten Punkte nummerieren die untersuchten Blätter von Cyclamen purpurascens. Die Extraktion der gDNA habe ich hier beschrieben und das Sequenzieren hier. Man kann zwei Sequenzfiles namens AB1 mit einem Programm namens SeqDoc vergleichen. Oben und unten sind die verschiedenen Sequenzen und in der Mitte die Gemeinsamkeiten (flacher Peak) und Unterschiede (großer Peak). Vergleich von 50 Basen auf dem ETS zwischen einer Pflanze aus dem Tessin und einer aus Niederösterreich. Ein anderer auffälliger Unterschied ist im ITS1. Hier ist ebenfalls bei den Österreichischen Pflanzen eine Base (G) mehr. Chromatogramm mit zwei AB1 files von der Sequenzierung mit SeqDoc. 5′ Ende vom ETS mit 50 Basen von ausgewählten Standorten. Mit dem dem Programm Multi Sequence Alignment by CLUSTALW kann man einen polygenetischen Baum mit den Sequenzen der rDNA erstellen. Polygenetischer Baum mit den Sequenzen der rDNA. Kommen wir zu dem Rätsel, warum die Pflanzen aus dem Klostergarten Allerheiligen in Schaffhausen, die Pflanze aus Orljavac in Kroatien und die Tuttlinger Pflanze aus der Nähe vom Kraftstein die selbe Sequenz wie die Pflanzen aus Österreich haben. Die Pflanze aus Kroatien stammt aus der Nähe der Benediktiner Abtei des heiligen Mihovil. Benediktiner-Abtei des Heiligen Michael bei Orljavac. Das Kloster Allerheiligen wurde ebenso von den Benediktinern gegründet und bei Tuttlingen befindet sich das Kloster Beuron mit der Erzabtei St. Martin. Die Benediktiner legten schon früh Heilpflanzengärten an und brachten viele Pflanzen über die Alpen. Damals war es auch üblich, dass einmal im Jahr Bauern eingeladen wurden, um in den Gärten unterrichtet zu werden. Dieser Brauch war noch bis 1911 im Salzburgischen Kloster üblich. Salzburg war und ist mit der Erzabtei St. Peter ein Zentrum der Benediktiner. „Wolfgang Erdäpferl“ wurden Cylamen purpurascens von den Einheimischen genannt und es wurde ihm eine besonders heilende Wirkung bei Schlangenbiß, Migräne, Kopfbeschwerden und als Zaubertrank nachgesagt. (Siehe Salzburgwiki). Von wo aus genau -Salzburg oder Wien- die Benediktiner das Alpenveilchen ursprünglich verteilt haben, lässt sich nicht genau sagen. 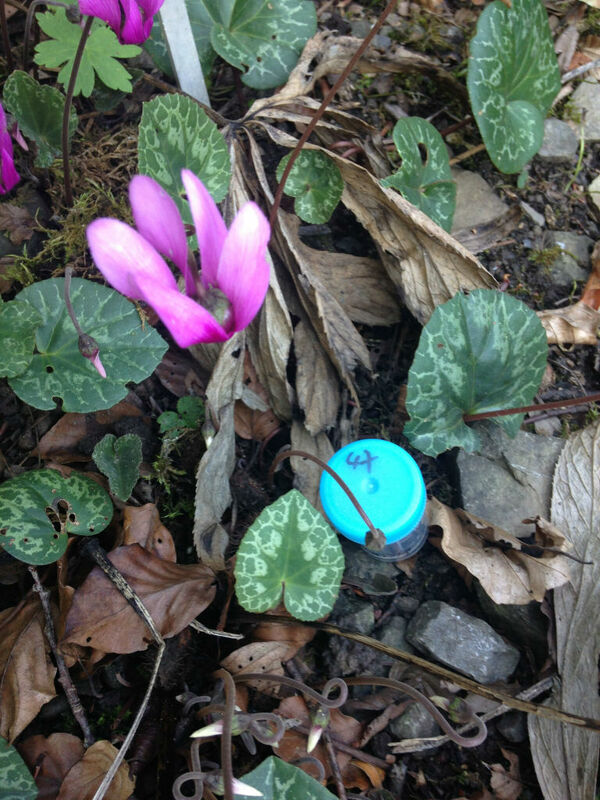 Es gibt sowohl im Salzburger Land, als auch in Niederösterreich Cyclamen mit der selben Sequenz der rDNA. Allerdings sind die Pflanzen um Wien einheitlich und die Pflanzen um Salzburg weisen zum Teil erhebliche Variationen auf. Es läßt sich also spekulieren, dass um Salzburg das „Erdapferl“, das im großen Stiel als Heil- und Fruchtbarkeits- Symbol für Pilger gesammelt und verkauft wurde, dadurch vielleicht etwas selten wurde. Womöglich wurde um Salzburg denn wieder mit Pflanzen aus den Klostergärten „aufgeforstet“. Cyclamen purpurascens war für die Benediktiner eine wichtige Heilpflanze die in den Klostergärten zu finden war und ist. Allem Anschein nach wurde das Alpenveilchen von den Benediktinern aus Österreich über die Ränder der Alpen hin verteilt. Wenn die Bedingungen für die Pflanzen gut waren, kann man sie heute noch finden. Allerdings stammt das Cyclamen purpurasecens im Brigachtal nicht aus Österreich. Woher es stammt, wird die Zukunft zeigen. Es fehlen mir noch einige natürliche Standorte. This entry was posted in Allgemein on 19. März 2018 by hannahadmin. Die Friedrich-Alexander-Universität Erlangen-Nürnberg publizierte in den letzten Jahren eine Reihe nicht schlüssiger Veröffentlichungen, auf die ich hier näher eingehen will. Tierversuche müssen nach §8 Tierschutzgesetz von der zuständigen Behörde (hier Regierung von Unterfranken) genehmigt werden. Die Behörde vergibt dazu eine Nummer. 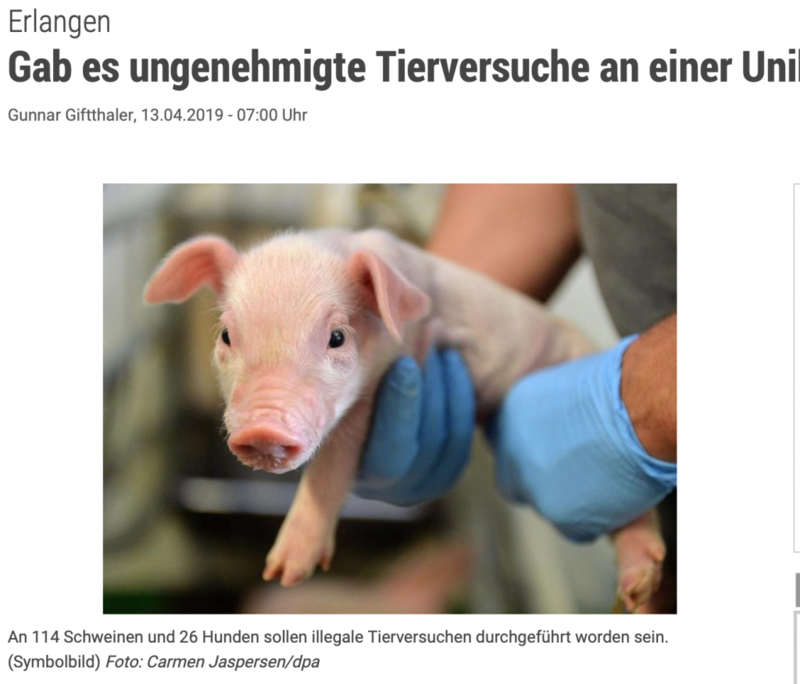 Mir ist aufgefallen, dass unter ein und derselben Genehmigungsnummer mehrere Tierversuche an verschiedenen Tierarten (Beagle und Schweine) publiziert wurden und dass für ein und denselben Versuch unterschiedliche Genehmigungsbehörden (Franken und Ungarn) angegeben werden. The influence of different abutment materials on tissue regeneration after surgical treatment of peri-implantitis – a randomized controlled preclinical study. Bone formation in peri-implant defects grafted with microparticles: a pilot animal experimental study. Periosteal elevation induces supracortical peri-implant bone formation. In vivo evaluation of biofunctionalized implant surfaces with a synthetic peptide (P-15) and its impact on osseointegration. A preclinical animal study. Search for a reliable model for bisphosphonate-related osteonecrosis of the jaw: establishment of a model in pigs and description of its histomorphometric characteristics. Establishment of a new pull-out strength testing method to quantify early osseointegrationdAn experimental pilot study. Diabetes mellitus negatively affects peri-implant bone formation in the diabetic domestic pig. Critical size defect regeneration using PEG-mediated BMP-2 gene delivery and the use of cell occlusive barrier membranes – the osteopromotive principle revisited. Extra-oral defect augmentation using autologous, bovine and equine bone blocks: A preclinical histomorphometrical comparative study. Was sagt uns nun diese lange Liste, ausser dass sie für mich sehr viel Arbeit war? Unter der Genehmigungsnummer 54-2532.1-45/12 finden wir verschiedene Experimente bei denen zum einem Teil Schweinen Implantate in den Kopf geschraubt werden und bei anderen Experimenten bei Hunden Implantate im Kiefer getestet werden. 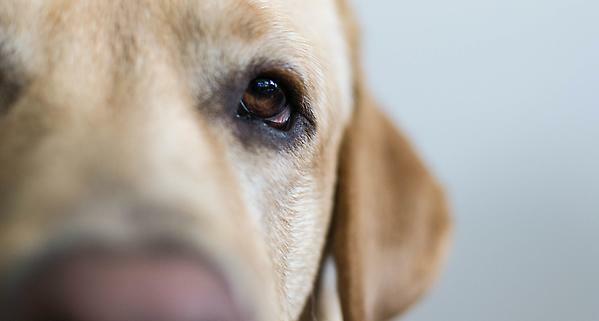 Bei den getöteten Hunden steht, dass diese Genehmigungsnummer von einem „Pest county government department for food safety and animal health“ in Ungarn vergeben wurde. Weiter unten bei der Studie von 2017 steht jedoch, dass die Studie an der Friedrich-Alexander Universität, Erlangen-Nürnberg durchgeführt wurde. Also vergibt Ungarn Genehmigungsnummern für Experimente an Hunden in Erlangen? Vergibt Ungarn hierfür die selbe Nummern wie Ansbach für Experimente mit Schweinen? Des weiteren gibt es unter der Nummer 22.1/121/3/2011 verschiedene Studien mit insgesamt 42 Schweinen und 10 Beagle, die alle an der Universität Erlangen durchgeführt wurden. Oder doch nicht? Zum Teil wird das Amt in Ungarn erwähnt, zum Teil nur ein „comittee“ oder „license“, einmal als Lieferant der Schweine (2015) die Renner GmbH, die, soweit ich informiert bin, nur in Deutschland Tiere liefert. Also doch Erlangen? 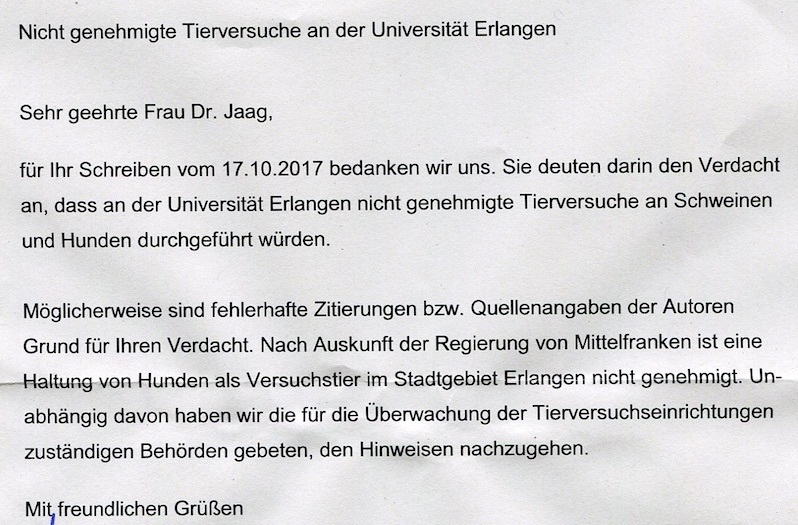 Da in den Veröffentlichungen um Professor Schlegel keine Kooperation mit Ungarn oder anderen Universitäten auszumachen ist, gehe ich davon aus, dass alle Versuche an der Universität Erlangen durchgeführt wurden. Dies wird auch zum Teil extra erwähnt. Soviel ich in Erfahrung bringen konnte, ist es nach dem ungarischen Tierschutzgesetz von 2013 verboten, Beagle in 6 Quadratmeter Käfigen in Einzelhaltung zu halten. Dies wird aber in jeder einzelnen Veröffentlichung extra erwähnt. Also werden die Hunde in den Buchten für die Schweine gehalten? Fragen über Fragen. Wer kann diese wohl besser beantworten, als die Universität oder das zuständige Amt der Regierung von Unterfranken? Ich habe letztes Jahr viel Zeit damit verbracht die zuständigen Stellen zu einer Antwort zu bewegen und hier will ich die Bemühungen auflisten. 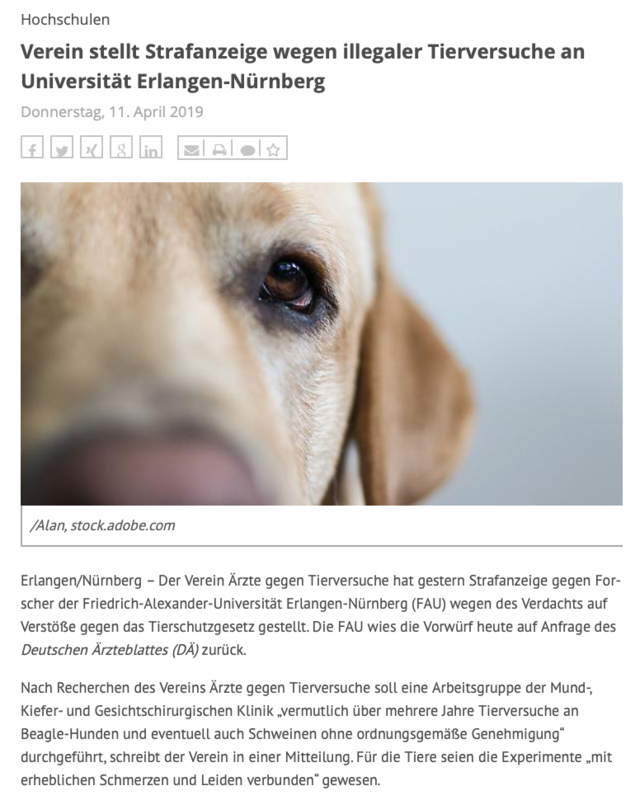 Zuständig für Tierschutzangelegenheiten der Friedrich-Alexander-Universität Erlangen-Nürnberg sind Mareen Ziegelmann und Dr. med. vet. Roland Jurgons. Auf meine Anfrage wurde tatsächlich am 21.08.2017 geantwortet. Auch wenn in der Antwort keine Informationen standen und sich natürlich nie wieder jemand gemeldet hat, so weiß ich es doch zu schätzen. Man benötigt also eine Anspruchsberechtigung, um zu erfahren, wie an einer Universität Tiere für Geld und Ruhm totgequält werden. Ja, berechtigt bin ich scheinbar nicht und dass ich mit den Genehmigungsnummern nicht vor habe Handel zu treiben, kann ich nur schwer nachweisen. Die Nummern scheinen so geheim zu sein, dass sogar die Universität diese frei erfinden muss. Hierauf bekam ich erst Monate später eine Antwort, nachdem ich das Bayerische Staatsministerium angeschrieben hatte. Mein Brief an die Ministerialrätin Frau Dr. Marscher wurde sehr freundlich beantwortet. Worauf hin sich auch die Regierung Unterfranken noch ein letztes Mal gemeldet hat. 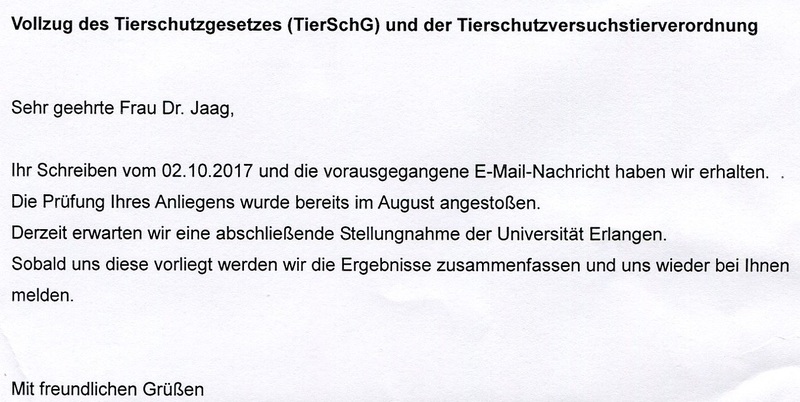 Des Weiteren habe ich versucht heraus zu finden, mit welcher ungarischen Universität ein Kontakt bestehen könnte und die fünf in Frage kommenden Universitäten angeschrieben. Als einzige Universität hat das Dekanat der Universität Budapest geantwortet. Beim Publizieren gibt es ethische Standards für Tierversuche. Diese werden als sogenannte „ARRIVE Guidelines“ für eine Publikation gefordert. Unter anderem werden relevante Lizenzen und eine ethische Überprüfungserlaubnis gefordert. Da die Nummern der Lizenzen in den Publikationen nicht stimmen können, habe ich die relevanten Verlage darauf aufmerksam gemacht, dass ihre ARRIVE Guidelines trotz gegenteiliger Behauptung nicht eingehalten wurden. Diese E-Mails gingen an das Journal of Cranio-Maxillofacial Surgery vom Elsevier Verlag und an das Journal of Clinical Periodontology Surgery vom Wiley Verlag. Die Gruppe um Professor Schlegel erwähnt als einzige das „Pest county government department for food safety and animal health“ in Ungarn erwähnt, folglich muss es da wohl einen Zusammenhang geben. Professor Schlegel hat 1998 in Budapest promoviert. Damals waren in Ungarn noch „wilde“ Tierversuche möglich und einige deutsche Institute verlagerten Tierversuche deshalb nach Ungarn. Inzwischen hat sich durch das ungarische Tierschutzgesetz von 2013 und auch durch die EU vieles geändert. Unter dem Namen „Pest county government department for food safety and animal health“ gibt es ein Amt der Regierung namens Nébih. Obwohl ich Ideen habe, wen ich noch anschreiben könnte, überlasse ich an diesem Punkt nach 8 Monaten Hinterfragen und Lästigsein, die Arbeitsgruppe um Professor Schlegel meinem Lieblingsverein und der Staatsanwaltschaft. Anscheinend ist von meiner Welle einiges bei den Herren angekommen. Ich vermute mal die vom Wiley Verlag. Bei ihrer neuesten Veröffentlichung, vom Dezember 2017, haben sie versehentlich wieder die gleichen Fehler gemacht. Da ist wohl zum wiederholen Mal die falsche Nummer 54-2532.1-45/12 rein gerutscht. Jetzt da bewiesen ist, dass diese nicht stimmt, wird schnell eine neue Nummer herbei gezaubert. Daneben wird bedauert, dass man die Tiere vor ihrem Tod nicht gemäß des Tierschutzgesetzes gehalten hat. Das war wohl nur ein Fehler im Satz. In Zukunft werden sie ihre Worte wohl besser planen, als ihre Taten. Am 10. April 2019 hat der Verein Ärzte gegen Tierversuche e.V. Strafanzeige gegen Forscher der Friedrich-Alexander-Universität Erlangen-Nürnberg (FAU) wegen Verdachts auf Verstoß gegen das Tierschutzgesetz gestellt. Es ist der totale Wahnsinn. Jetzt wären alle Studien nicht in Erlangen durchgeführt worden. Was sagt die zuständige Regierung von Unterfranken zu dem Thema? „Wir sind insbesondere bei dem heiklen Thema der Tierversuche äußerst transparent“, so Pressesprecher Johannes Hardenecke gegenüber idowa. Zwischen 2007 und 2012 habe es nachweisbar keine Tierversuche gegeben, der Zeitraum zwischen 2013 und 2018 werde derzeit überprüft. Da hängen sicher einige Dr. Arbeiten mit drin. Das meiste hab ich ja gar nicht übersetzt, weil das mit den Schweinen und Erlangen hatte ich geglaubt. Seit 2001 keine Tierversuche mit Schweinen in Erlangen? Jetzt bin ich erst mal sprachlos. Es ist mir noch nicht ganz klar, sind die so doof oder warum sind die so selbstsicher? …so Pressesprecher Johannes Hardenecke gegenüber idowa. Zwischen 2007 und 2012 habe es nachweisbar keine Tierversuche gegeben, der Zeitraum zwischen 2013 und 2018 werde derzeit überprüft. „Nach Genehmigung des Tierversuches durch die zuständige Tierversuchskommision der Regierung von Mittelfranken, Ansbach (Genehmigungsnr. 54-2531-25/07) wurden 15 Tiere in die Studie eingeschlossen, die hier auf 4 Versuchsgruppen aufgeteilt wurden. Es gab 2 Opferungszeitpunkte in der jeweils diabetische und gesunde Schweine geopfert wurden. 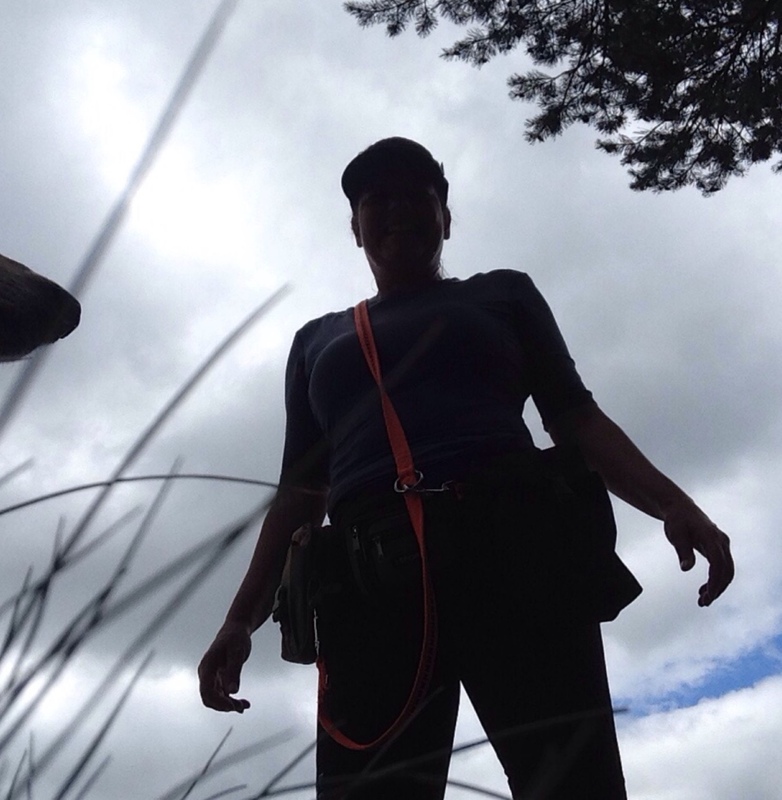 Am ersten Opferungstermin (nach 30 Tagen Einheilung) wurden 7 Tiere (2 mit gesunder und 5 mit diabetischer Stoffwechsellage) geopfert. Nach 90 Tagen post implantationem wurden die übrigen Tiere (2 mit gesunder und 6 mit diabetischer Stoffwechsellage) geopfert. This entry was posted in Allgemein on 26. Februar 2018 by hannahadmin.